I finally managed to get my hands on all the vintage t-shirt books published in the last few years. 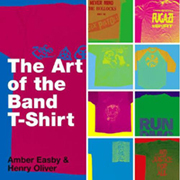 Truth be told, I would recommend any book that contains photos of vintage tees, even if it was scribed in crayon by a two year old child. Meet the authors: Amber Easby has worked for bands such as the White Stripes and the Raconteurs as their merchandiser. Henry Oliver played in the band Die! Die! Die! and designed their album covers and T-shirts. When it comes to vintage t-shirt books, this one screams KISS. No, I don’t mean it’s full of Gene Simmons merchandise; I mean, it keeps it simple, stupid. The fact that the book is only six by six inches is part of what makes this work – there’s no room for any B.S. And I agree with this approach; it’s a t-shirt, not the Mona Lisa. I don’t think it’s necessary to dissect every shirt like it’s art history class. Not to say that one day some of this schwag shouldn’t appear in the Louvre, but let people a few centuries from now worry about that. Until that day, I see vintage tee, I read blurb, I flip page, I happy. If anyone is going to dissect the artwork and tell us what they were trying to tell us, it should be the designer or band. Well, in this book they do. It includes a handful of interesting blurbs that detail what they had up their sleeves: i.e. learn all about the Rolling Stones’ logo directly from the horse’s lips. The intro to this one is tops amongst the five vintage tee-related books I have in my possession. A well-scribed mental time lapse of the origin of the t-shirt and its evolution into the band tee. Then we are treated to a few cool vintage photos of people wearing, you guessed it, tees. Keep in mind the book doesn’t limit itself to strictly vintage, or original vintage at that. It does go beyond 2000 and has more than a few admitted reprints scattered throughout. There are plenty of Screen Stars, old Hanes and completely worn tags in there for the vintage heads out there. While I would have preferred these pages to be vintage-oriented, the book doesn’t claim to be vintage-centric, just band tee obsessed. The latter part is still worth a look; and something tells me that in 10 years from now I won’t be complaining about any of the shirts featured. After writing this, I realize this book is as far from a KISS (the band) book as it can be, given that not a single KISS shirt appears in it. A little ironic, given that Simmons prides himself on being merchandise iconic. Are the authors sticking their tongues out at KISS? I say bonus points. I get enough of KISS merchandising when I’m flipping through channels and Family Jewels is on. I fully recommend adding this book to your library.